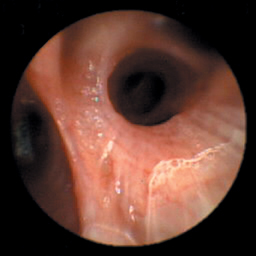 On review of the study, the video capsule appeared to bounce around in the pharynx a few times before entering the trachea and moving to a bronchus, where it remained for the duration of the recording (Figure 1). 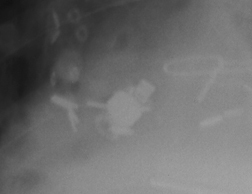 A portable chest radiograph demonstrated a radiopaque foreign body in the right lower lobe bronchus (Figures 2A and 2B). 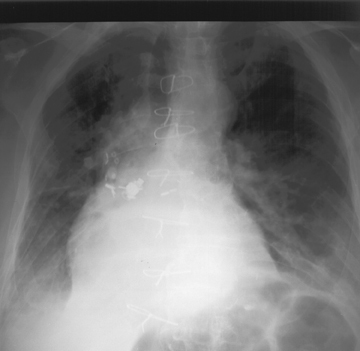 A chest radiograph, taken after a diagnostic and therapeutic procedure, demonstrated absence of the previously described foreign body. A specimen radiograph was also obtained (Figure 3). Cardiothoracic surgery was consulted following review of the recorded video study and initial chest radiograph. A rigid bronchoscopy was then performed. Interestingly, the physician who performed the bronchoscopy reported the capsule was initially identified within the left lower lobe bronchus. The capsule was grasped and being removed to the level of the trachea when it slipped and fell into a right bronchus. After 90 minutes of repeated attempts to remove the video endoscope, the capsule was successfully grasped and removed via a snare. Fleischer, et al., suggest specifically questioning the patient about difficulties swallowing solid foods and pills.9 Following confirmation of aspiration, our patient did state occasional difficulty swallowing pills, however, he denied any prior episodes of known aspiration. Sinn, et al.,suggest preliminary evaluation with a video esophagram in patients with a history or risk of aspiration.7 They also state that the video endoscope should be endoscopically placed in the duodenum with an overtube in cases of urgent need for the procedure. 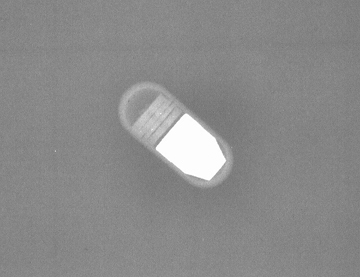 As with the case reports cited previously, our patient did not have an adverse outcome, as the capsule was removed without complication. Eliakim R. Wireless capsule video endoscopy: Three years of experience. World J. Gastroenterol. 2004;10:1238-1239. Ali A, Santisi JM, Vargo J. Video capsule endoscopy: A voyage beyond the end of the scope. Cleve Clin J Med. 2004;71: 415-425. National Institute for Clinical Excellence: Interventional procedure overview of wireless capsule endoscopy. January 2004. Available at: http://www.nice.org.uk/guidance/index. jsp?action=article&o=31215. Accessed February 15, 2011. Swain P. Wireless capsule endoscopy. Gut. 2003;52: iv48-50. Pennazio M, Santucci R, Rondonotti E, et al. Outcome of patients with obscure gastrointestinal bleeding after capsule endoscopy: Report of 100 consecutive patients. Gastroenterology. 2004;126:643-653. Schneider AR, Hoepffner N, Rosch W, Caspary WF. Aspiration of an M2A capsule. Endoscopy. 2003;35:713. Sinn I, Neef B, Andus T. Aspiration of a capsule endoscope. Gastrointest Endosc. 2004;59: 926-927. Tabib S, Fuller C, Daniels J, Lo S. Asymptomatic aspiration of a capsule endoscope. Gastrointest Endosc. 2004;60: 845-848. Fleischer DE, Heigh RI, Nguyen CC, et al. Videocapsule impaction at the cricopharyngeus: A first report of this complication and its successful resolution. Gastrointest Endosc. 2003;57: 427-428. Video endoscope aspiration. Appl Radiol.